Discover examples of our delicious new menus below. All prepared with passion and care under Chris Harrod’s direction, using locally sourced foods and ingredients freshly foraged from our own surroundings. 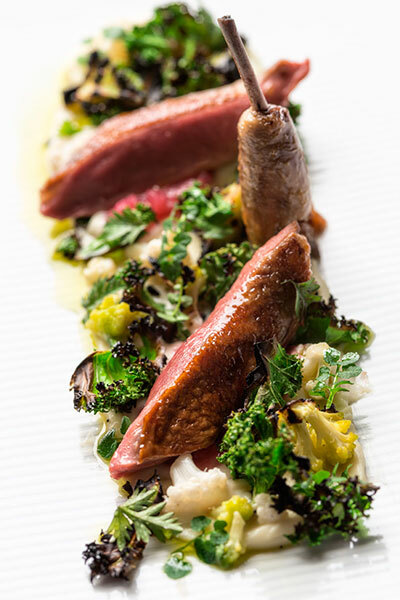 We use an original combination of herbs such as Pennywort, Three Cornered Garlic, Bitter cress, Wild onion, Hogweed, Lesser Celandine and to inspire the special style of our cuisine, and to bring the flavours of the valley to the plate. Our suppliers are carefully selected farmers and producers in Ross-on-Wye, Wye Valley, Brecon Beacons and Pershore who all take a pride in the quality, freshness and flavours of their fruits, vegetables and meats. Our Restaurant manager follows Chris’s vision, and has created an excellent wine list championing local wines, independent growers, organic and biodynamic producers and lesser-known grape varieties. Enjoy!